We’ve talked about Koble a few times over the past couple of years – a unique-in-its-market, global business-to-business matchmaking platform; it connects buyers with suppliers and vice-versa. You may remember our report last year that it had signed an Asia-wide exclusive licensing agreement with Xpand, a subsidiary of Axiata Group Berhad, one of Asia’s largest telecommunications groups, to offer millions of SMEs a digital business matchmaking service. Koble is certainly growing in take-up and reach – it now has 11 million Koble Pages (we’ll get onto that in a moment) on its app, and its use is widespread across Asia, the US, Malaysia and other parts of the world (not the UK and Europe just yet – but that will undoubtedly come). It’s undergone a bit of an exciting transformation too since we last caught up with Fabrice Saporito – Koble founder and creator – making it more user-friendly, more accessible and, for Koble developers, more scalable. Koble 1.0 was what he describes as a ‘captive platform,’ sitting behind a gateway. While it allowed users to do all the good things of discovering and communicating with potential buyers, or suppliers, with a high emphasis on privacy and chat, you had to know about it to use it, and create a user profile to be active. It wasn’t designed for organic growth, or scalability. So, in a data-driven decision, the Koble team decided to redesign the capture model into something better-architected towards faster growth and greater use. This would enable them, primarily, to do two things: have a product that could be more enhanced for SEO and deliver value straightaway to the user, and, simplify the product to make it easier to adopt, with no gatekeeper and a ready-made database of companies that did not rely on organic growth through sign-ups. Koble Pages are now far more than the incumbent ‘listings’ – they contain all the relevant information about a company you could find if you spent hours trawling the web. Koble aggregates information from multiple sources to make it available in one place, using machine learning and a little manual intervention for accuracy. For any given company this might include a description, the logo, basic contact details, financial information, business location, products/services, markets, customer references, reviews, awards, certifications, and so on. Businesses have no leg work to do, they can simply claim their page, join Koble, and be contacted to a whole network using the second feature – Koble Chat. Pages are publicly visible and provide a trusted B2B community. What used to be a ‘feed’ on Koble 1.0, rather like LinkedIn or FaceBook, is now incorporated into the company profile – the team learnt that users wanted to get straight to the details of the company, with everything in one place. So that’s what they’ve delivered, with added deep information like comparison reviews and user rankings, the crowd-sourced comparisons you expect from product buying. Koble tell us that unlike the B2B network that some large procurement solution providers offer, theirs has deeper and wider information. The largest of those other platforms, by way of comparison, boasts 5.4 million companies on the network, with 40% showing markets served and reviews for 6,400 of them. Koble has almost 11 million companies on its network, with detailed information for all of them and 46,000 reviews – aggregated for the user needs, rather like a ‘Trivago’ effect. This is the point at which the service ceases to be free. 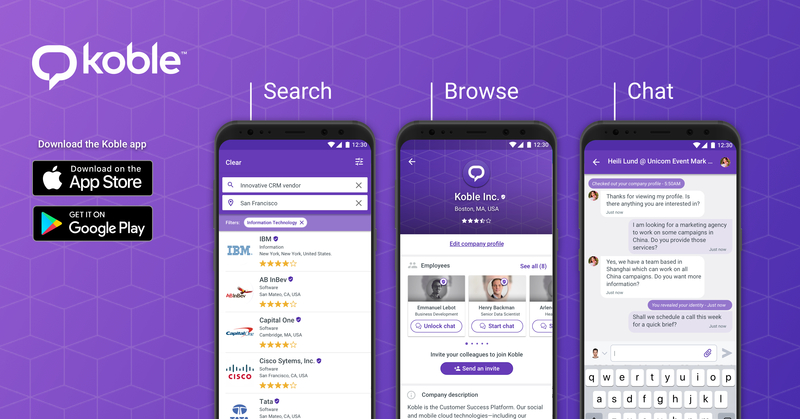 Companies can easily browse through thousands of relevant prospects, and receive notifications and real-time activity updates, like company news, through the new Koble Chat feature. There is a very reasonably priced banding for this. Users can capture traffic and connect directly, and all conversations and histories are tracked. The beauty of this chat feature is that page visitors can start conversations with potential business matches anonymously, until they decide the relationship is mutually beneficial enough to take it further. Koble have found that visitors are ‘twice as likely’ to reach out and start a conversation without identification, which can lead to more frequent and lucrative business connections. So, a lot or work is still going on at Koble, like optimising for highly language-relevant content – but it certainly sounds like it is making great strides. Fabrice informs us that the depth of information and the approach they use will be perfected before entering new regions – so we wait with anticipation. Koble can be accessed by downloading the app from the Apple Store or Google Play.